Dingle harbor ... Fungi the dolphin ... optional Kayaking ... tour and tasting of the Dingle Distillery ...Crean’s Brewery ... and much more! Today’s ‘Whiskey and Castle Tour’ takes us to the heart of the midlands. Our first stop is the world famous Tullamore DEW Whiskey Distillery, founded in the 19th century by Daniel E. Williams who created the first triple distilled, tripled blended Irish whiskey. During this informative tour, we learn the process of whiskey making and the history of this unique whiskey brand. We continue to Birr Castle. Historic stone castles surrounded by greenery are not in short supply in Ireland, but Birr has become known as a “hidden gem” of the country. Our castle tour includes its award winning gardens. The castle also features a museum of Ireland’s historic scientists and their contribution to astronomy and botany and the largest telescope on earth in the 19th century. After lunch in the lovely village of Birr, we continue to Kilbeggan Distillery, the oldest licensed whiskey distillery in Ireland. It was founded by Matthias McManus in 1757. Situated on the banks of the river Brosna, plenty of the three natural ingredients needed for whiskey distillation are available: turf, grain and water. Our visit today takes us back in time to discover how Irish whiskey was made in the 19th century. We will be back in Dublin early evening. Attracting visitors from all over the world, Blarney Castle is situated in Blarney village, a few miles north of Cork city. An ancient stronghold of the McCarthy's, Lords of Muskerry, it is one of Ireland's oldest and most historic castles. Built in 1446, the castle is famous for its Blarney stone, the ‘Stone of Eloquence’, which is traditionally believed to have the power to bestow the gift of eloquence on all those who kiss it. Many legends tell the story of the Stone, but why not kiss it and find out the truth behind the legend. The Castle gardens feature a water garden, a fern garden and a poison garden. Our excursion continues to Cobh. This picturesque port town was known as Queenstown until the late 1920s, and of the millions Irish citizens who immigrated to North America, it’s believed nearly half of them departed from Cobh. Most famous, however, is the tale of the Titanic, which departed on its fated North Atlantic crossing from right here in Cobh. Take in the stunning views of Ireland's coast from a different perspecctive as you kayak around the Dingle Peninsula. Enjoy a half-day's sea kayaking in Dingle Harbour, see Fungi the Dolphin at the mouth of the harbour and explore some of the many sea caves.This trip is available to all - beginners to advanced paddlers. Although not physically demanding, it provides a great introduction to sea kayaking, covering basic kayaking skills. This tour is unique; it speaks to those for whom the days of sweet and simple are no more, and the reign of sophisticated distilling and microbreweries has arrived in conjunction with a passion for healthier eating and ‘farm-to-table’ foods. If you are looking to learn and explore this new lifestyle, Ireland, as rich with history as it is with beauty, offers you the chance to explore all of these facets. Knowledge is shared by individuals and families who have spent a lifetime creating and perfecting these beverages and culinary experiences. Prepare to open your mind and your taste buds while travelling along the southern coast of Ireland from Dublin to Dingle on a journey filled with sights you’ll never forget. Don’t wait, come with us on the trip of a lifetime. Sláinte! Board your overnight flight to Dublin today. Welcome to Ireland! This afternoon, join us for a visit to the Teeling Distillery, the only operational distillery in the city, for a tasting. The tour continues to the Guinness Storehouse, making sure to stop by Brewer’s Dining Hall for a taste of Guinness straight form the source. Time permitting, we end the day with a tour of the historic Dublin Jameson Distillery where the spirit was originally distilled and bottled before moving to its new home in Midleton. At night, regroup for a welcome dinner and orientation with your tour director. Enjoy a free day to explore Dublin on your own. You may want to look into a hop-on-hop-off bus tour to see all that the city has to offer. Want to learn more about the art of distilling whiskey? Consider joining an optional excursion to the Tullamore Dew and Kilbeggan Distilleries. Tullamore Dew is a resoundingly popular Irish blend, particularly in overseas markets, where it is second only to Jameson; and Kilbeggan is the oldest working distillery in the world - this is an option you won’t want to miss. Those going on the excursion can expect a full day of whiskey filled knowledge with a pit stop at Birr Castle and lunch in between tours. On route to Cork, we stop to explore the Jameson Distillery in Midleton. Your route continues to beautiful Ballymaloe, a famous cooking school in Southern Ireland run by celebrity chef Darina Allen. The farm is accompanied by a full restaurant, shop, and café. We’ll tour the organic gardens of this amazing establishment that practiced ‘farm-to-table’ service before it was cool. Afterwards we’ll enjoy lunch at the farm's restaurant before heading to the hotel in Cork. The rest of the night is open to exploring the city on your own. On this free day in Cork, see what the city has to offer or take a bus down to the fishing town of Kinsale for the day. This centuries-old port offers a variety of activities from whale watching and sailing to ghost tours. Don’t miss out on a deliciously fresh seafood dinner if you spend the day in this maritime town. You may also want to consider joining an optional excursion to Blarney Castle. 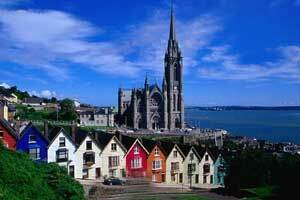 Spend the day exploring the grounds, leave a kiss at the Blarney Stone, and visit the heritage town of Cobh. This morning we visit the English Market, which is one of the oldest and most well-known markets in Ireland. A blend of local organic foods mixed with fares from all over, this market has been around since the 18th century. Before heading to Dingle, we stop at the Franciscan Well Microbrewery to enjoy some lunch at the Well’s brick oven pizza pub situated right on the River Lee. On the way to Dingle, we stop for refreshments in Macroom by the famous castle gate house before we continue to our hotel to check in and enjoy free time. Consider a morning kayaking excursion. Paddle around the peninsula and finish your trip off with amazing views and some serious relaxation, or enjoy a free morning before we begin a tour and tasting of the Dingle Distillery. Afterwards we head to Crean’s Brewery for a visit. Meet the brewers who create this local Irish lager before sitting down and enjoying a pint. Spend the rest of the afternoon checking out some of the town's famous sights and insanely gorgeous views, go for a hike, then join us for our farewell dinner at a local pub. After breakfast the group says goodbye to Ireland, filled with not only delicious Irish food and spirits, but also with the knowledge of what goes into making some of the great beverages of this country and a feeling of having seen how incredible this isle truly is. Stop in for some delicious baked goods, soups and sandwiches. As one of Dublin's most famously recommended cafes, be sure not to miss it if you get a craving for something sweet during your freetime. During your freetime in the evening head to Andrews Lane for some amazing local live music. Voted the most exciting venue in the city. If you're looking for a relaxing outdoor activity, take a stroll through Phoenix Park or St. Stephen's Green, the two most popular and beautiful parks in the area. Visiting the Irish Whiskey Museum and the Little Museum of Dublin are definitely fun and educational ways to spend your spare time in the city. If you're a lover of whiskey, take a look into the history and evolution of some of Ireland's most famous whiskeys. To learn a little bit more about this gorgeous city, stop into the Little Museum of Dublin to experience Dublin's fascinating history. If you just want to take in the city scene of Dublin on your own schedule, stop by Dublinbikes and rent a bike for the day and simply go exploring. For those looking for a little culture, take in a performance at the Abbey Theatre and enjoy a night of theatre in the country that brought you some of the most renowned playwrights such as Samuel Beckett and Oscar Wilde. In the heart of Cork City and with an eye-catching fountain at its center, this quirky roofed food market has been trading since 1788. Under the possession of the Cork City Council, it's one of the world's oldest municipal markets. Artisan breads, fruit, and freshly caught seafood are just some of the specialities on offer. In recent years, the market gained worldwide fame when Queen Elizabeth II of Great Britain dropped by on her first ever state visit to the Republic of Ireland in 2011. In addition to a wide range of produce, visitors can grab a coffee here or sample local fare at Farmgate Restaurant. Initially conceived in the early 18th century by wealthy merchants presumably anxious to part their fellow citizens from their cash, this has remained Cork's main shopping hub. 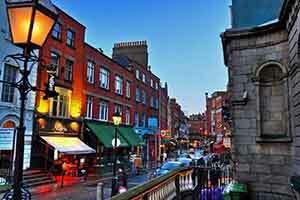 An easy couple-of-minute's stroll from The English Market and known locally as "Pana" the broad, curving street boasts many fine shops including upmarket department store Brown Thomas. Shopping, of course, is one thing, but the citizens of Cork are a sociable bunch and, particularly during fine weather, visitors will see groups of friends and family simply chatting and spending time together. Various architectural styles reflect change over the past two hundred years or so. Dating from 1786, and rebuilt on several occasions since then, St. Patrick's Bridge abuts the thoroughfare. The eye-catching structure in French Early Gothic style was designed by William Burges and consecrated in 1870. It's situated on a site where Christian worship has been taking place since the 7th century. By its completion, in excess of £100,000 was spent on the building, an enormous amount of money at the time. Prior to the re-design a more modest Georgian style building and bell tower stood in its place. The interior is richly decorated with fine mosaics in the choir and sumptuous artwork in the chancel. A little under a half hour's southerly drive from Cork, and at the gateway to scenic West Cork, is the quaint deep-sea fishing and yachting town of Kinsale. 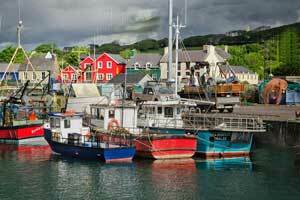 Once a medieval fishing port, historic Kinsale is one of the most scenic resorts on Ireland's southwest coast. Visitors will find no shortage of cafés and restaurants to suit every taste, and the surrounding scenery is quite simply breathtaking. In recent years, the town has also become a world-class golf destination. Other activities include heritage town walks, an annual gourmet festival, a wine museum and, in neighbouring Summercove, 17th-century Charles Fort. Fungi is Dingle’s pet bottlenose dolphin. He moved into the harbour the week after NBC broadcast the very last episode of MASH (coincidence? we think not!) and has been there ever since. This is one friendly dolphin! He is said to enjoy reading, the movies (obviously!) and crochet. But more than anything he enjoys swimming with any homosapiens willing to jump in the sea with him. This correspondent hasn’t yet had the pleasure, but apparently it is a life changing experience. Enquire at Brosnan’s on Cooleen, a street on the east side of the harbour. Or you can check the famous fellow out from the relative dryness of a boat. Though only 7 years old, Murphy’s Ice Cream on Strand Street in Dingle is already legendary. This isn’t just ice cream, this is ice cream perfection. So skip the restaurant desert and instead head to Murphy’s. This determined ice cream detective recently investigated samples of their Pink Champagne Sorbet, Honey Cardamom and Chocolate Whiskey ice creams and left the parlour in an altogether different mood. Ice cream as it should be – mind altering! Murphy’s also serves the best coffee in town. Additionally, the staff are some of the most cheerful & friendly people around! Irish mountains are really only large hills (the highest is only just over 3,000ft), so most can be climbed in a matter of hours. And yet the reward is unimaginable. Unlike most lofty mountain ranges whereupon reaching the summit you are merely surrounded by many other lofty peaks, in Ireland reaching the summit of the local highest ‘mountain’ means you will probably have an uninterrupted view of a whole quarter of Ireland in front of you while the Atlantic yawns, stretches and glistens behind you. And Mount Brandon on the Dingle Peninsula is probably the greatest of Ireland’s local highest mountains simply because the surrounding scenery is Ireland’s greatest. Start just beyond the village of Claghane (over Conor Pass from Dingle) parking near Miss O’Connors’ House. Ask in Dingle or Cloghane for the best route. Best saved for a clear day. 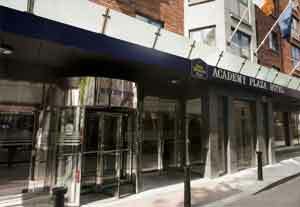 Just off O'Connell Street, Best Western Plus Academy Plaza Hotel is a 5-minute walk from Connolly Train Station. The hotel features stylish, air-conditioned rooms with free Wi-Fi, an on-site restaurant and a beauty salon.The modern bedrooms at the Best Western Plus Premier Academy Plaza Hotel feature flat-screen TVs, work desks and marble-finished bathrooms. 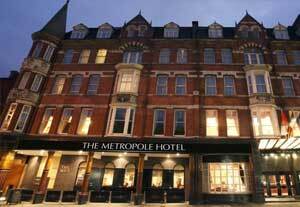 In the heart off Cork, Hotel Metropole is just a short walk from the city’s business district and many excellent shops, boutiques, theaters and galleries. Guests have free access to the on-site Leeside Leisure Centre which features an indoor pool, a hot tub, a sauna and a well-equipped gym. 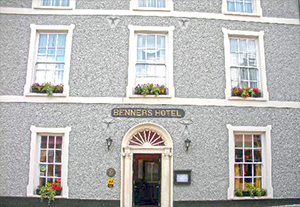 Locate in central Dingle, Benners Hotel offers traditional, spacious rooms and Irish cuisine, on the shores of the Dingle peninsula.It is a a classic hotel with old world charm and ambience. Each room has satellite TV and tea/coffee facilities. Free WiFi is available throughout. * Price per person based on a twin share room. If you're traveling alone, and do not want to pay the single supplement, AESU will attempt to arrange a share with a same-gender traveler. If shared accommodations are not available or you prefer a single room, a single supplement of $425 will apply. Email Ireland to a friend!